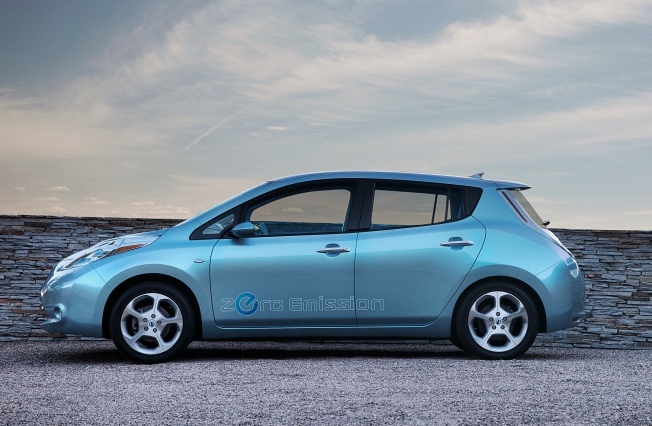 This undated photo made available by Nissan, shows the 2011 Nissan Leaf. The first all-electric car offered in the United States by a mainstream auto manufacturer since the early days of the automobile, the new-for-2011 Leaf has seats for five, a roomy, straightforward interior and a surprisingly solid, stable feel. The 2011 Nissan Leaf is nothing less than miraculous. After decades of waiting fruitlessly for commercialization of various science fiction inventions like the jetpack, the flying car and the robot maid, Nissan has finally delivered a regular, normal everyday car that runs on battery power. Yes, electric cars have existed almost since Gottlieb Daimler built the first car and there have always been various limited-production, astronomically expensive electric playthings, but the Leaf is the first modern mass-produced fully capable car that eschews internal combustion. With a $35,430 as-tested price, the Leaf is not inexpensive, but neither is it prohibitively priced, especially with the $7,500 federal tax credit helping whittle a chunk off the bill. Even more attractive is Nissan’s $350 a month lease, which should make the car accessible to many mainstream drivers. Of course limited driving range has been the primary obstacle to widespread electric car adoption and the Leaf lacks the range of gas-powered cars. But for many drivers its range is enough to do most of the jobs cars need to do. Suburban multi-car households can use their second car for family trips, and urban singles might decide to fly or take the train for interstate travel, but for everyday use, the Leaf really is a suitable vehicle. However, there is some debate on the Leaf’s actual driving range. The EPA says it’s 73 miles, based on its testing regime. My real-world driving stretched that to 80 miles in suburban driving with 55-65 degree temperatures. Nissan says that slogging through 15 mph traffic in 14-degree weather with the headlights burning produces a range of 62 miles, while cruising at 38 mph in perfect 68 degree whether lets the car go 138 miles. It is good to know that the worst-case scenario range is 62 miles because that’s still a reasonable range for most round-trip commutes. The claimed 138 mile range is a bit more dubious, and of course even if it’s true, it’s pretty useless because it would be unusual for anyone to cruise willingly at 38 mph for 138 miles. Software glitches aside, the Leaf drives like a regular economy car on the road and offers all the expected amenities, so once the driver has gained confidence that it will not strand him significantly short of the projected battery range, it’s easy to use the car for daily commuting, errands and the endless soccer-mom chauffeuring that consumes so much time (and gas) in the lives of many drivers. Space for five occupants — compared to the four-seats in the Chevrolet Volt — makes the Leaf a stronger candidate for carpool duty. It’s this suitability for everyday use that makes the Leaf miraculous. The car’s limited range is manageable because the driver is kept continuously informed of the battery’s state of charge, the predicted remaining driving range and the estimated length of time needed to recharge the battery. This lets drivers calculate whether they can use the car for another trip, say at lunchtime, after an additional few hours of charging at work in the morning, or, more significantly, when the car will be ready to return from a drive at the end of its maximum driving range. The Leaf’s battery pack is necessarily large, which means that it takes a long time to charge it using a plain old 110-volt wall outlet. Nissan says that it takes 20 hours to fully recharge a totally depleted battery using a 110-volt outlet, although the computer onboard the Leaf I tested showed 22 hours to charge with 15 miles of range remaining. The 110-volt charger might trickle a few electrons into the battery during the course of the day as an insurance policy while parked at work, but for effective overnight charging the 220-volt outlet is a must. When the car reaches about 15 miles of range a blue button on the steering wheel reveals a map of nearby charging stations on the standard navigation system. Unfortunately, there aren’t any quick-charging stations in the Washington, D.C., area where I tested the car. But these stations are common in some of the West Coast cities where Nissan will sell the car initially. In fact, there are more charging stations than gas stations in San Diego and Seattle, according to Nissan. They offer 440-volt quick charges that can bring the Leaf’s battery to an 80 percent charge in less than half an hour. Yeah, that’s longer than filling a gas tank, but the average Quickie Mart visit is 23 minutes, Nissan says, so a few minutes browsing the nutritious snacks, quality sunglasses and selection of classic rock music on cassette tapes should just about do it. But will driving an electric car really save you money? The EPA says that the annual electric cost to power the Leaf for 15,000 miles is $561, which is about one-third the annual cost of gassing up the company’s Versa subcompact, which is similar in size. As for the car itself, the Leaf is an unremarkable economy car. The numb, over-assisted electric power steering contributes to a synthesized, artificial driving experience reminiscent of a driving simulator, and the budget suspension parts and fuel-economy tires leave the handling wanting. But the ride is excellent for such a small car, which benefits from its “road-hugging weight” courtesy of the internal battery pack. At highway speed the electric motor emits a distant high-pitched whine that drivers of a certain age will clearly recognize as the sound of a phaser set on overload. Thankfully it never blows. It’s also pleasing to see the Leaf features upholstery made from recycled materials, such as seats made from PVC bottles. What’s less pleasing is the Leaf’s interior, which actually looks like it’s made from recycled materials. In fact, Nissan was deluged in hate mail after a false Internet rumor said the company was planning to offer leather seats in the Leaf. Apparently, this prospect offended the “Guardians Of All That Is Good,” who threatened dire consequences if recycled bottles were not the sole Leaf seating surface. For consumers who are on board with the electric drive thing — but who don’t want to turn their car seat over to read what recycling number is stamped on the bottom — Nissan has already said that there will be an Infiniti luxury car that uses the Leaf’s drivetrain in the near future. And I imagine it will have leather seats. For now, however, my only real disappointment with the Leaf came when I discovered that having an electric car does not mean never driving to a gas station. The kids are getting Hess Corporation’s annual toy truck for Christmas again this year, and Hess gas stations are the only places to buy them, so I drove Nissan’s electric car to a gas station to get it.